The CDT has presented Jemma with tons of opportunies to get involved in outreach activities and share her passion for science. I am a 2nd year PhD student studying super-resolution ultrasound imaging with microbubbles. This technique has the potential to visualise the smallest blood vessels in the body - important for understanding, diagnosing and treating any disease that affects the microvasculature. Microbubbles are tiny bubbles around the same size as red blood cells that can be injected into a patient's blood system. Individual bubbles have a strong enough signal to be seen on ultrasound images. By injecting a low concentration of these bubbles we can detect individual bubbles and mark their position very accurately. Over time, hundreds of localisations allow us to build up a map of the vasculature. My work is very varied and so far has involved computational modelling of the super-resolution process, developing and comparing signal processing techniques and experimental work such as designing and testing objects which mimic microvasculature. How did you get involved in outreach and why? mobility, so wanted to help organise public engagement to attract students may not otherwise have much exposure to the opportunities within science. What have been your favourite moments when doing outreach work? There have been several opportunities to get involved in outreach during my PhD. Within the CDT we have worked together to develop youtube videos, school workshops on magnetic resonance imaging (MRI) and podcasts. 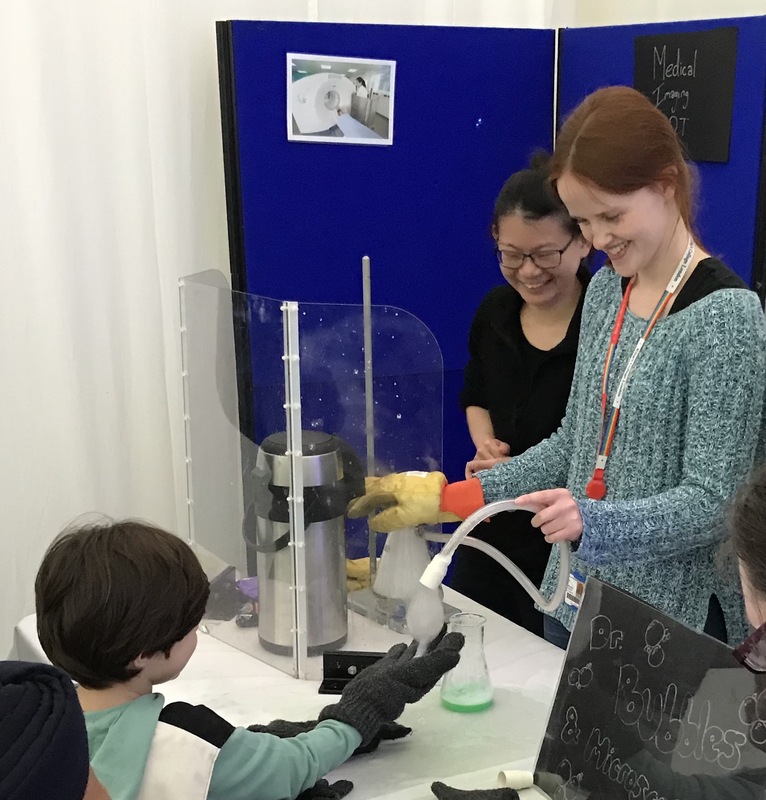 We have also developed a stand at Imperial Science Festival explaining how bubbles can be used for imaging and helping to deliver drugs to the brain. This involved making smoke filled bubbles from dry ice! One of the projects I have enjoyed the most is the School 21 Project. We hosted 11 students to complete work experience projects over 14 weeks within various research groups. At the end of their time they all gave fantastic presentations to show off their results. Within the CDT we have worked together to develop youtube videos, school workshops on magnetic resonance imaging (MRI) and podcasts. How can other CDT students get involved?